The Pride Agenda is proud to give our endorsement to Dan Quart in the Special Election to fill the open Assembly seat in the 73rd district located on the East Side of Manhattan. Dan is a first-time candidate running to fill a seat long held by pro-LGBT legislators. Our community must ensure that the seat remains firmly in the hands of a legislator who will champion our issues and advance an agenda of equality and justice for LGBT New Yorkers and our families. The Pride Agenda’s endorsement criterion is rigorous. Dan gave uniformly positive responses on our candidate questionnaire regarding the dozens of issues we have identified as part of our LGBT equality and justice agenda. This includes his support for a state human rights law to prohibit discrimination based on gender identity and expression, and state funding for community-based programming to meet the specific health and human service needs of LGBT people, in areas like mental health, substance abuse, domestic violence and homeless services. As the race heats up in the next few weeks, spread the word about Dan and his candidacy. Let your neighbors know about his pledge to advance a pro-LGBT agenda. Dan’s voice will help ensure the Assembly maintains its record of leadership on issues of concern to our community. 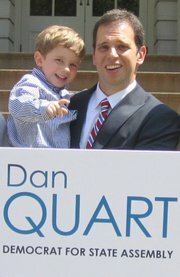 And most importantly, vote for Dan Quart on election day: September 13, 2011! Support the Pride Agenda’s Political Action Committee so we can continue to support pro-LGBT candidates in the movement towards equality and justice. I am frequently asked whether New York ever talks to our colleagues in other states in an effort to share ideas and information. 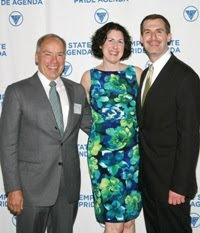 The Pride Agenda is a proud member of the coalition that allows for just that interaction: the Equality Federation, the national alliance of statewide LGBT advocacy organizations. Members of our staff travelled to Madison, Wisconsin this past weekend for the Federation’s summer meeting, where state LGBT organizations had the chance to learn from each other, strategize together and recharge our batteries with the inspiring tales of the amazing work being done in states throughout the nation, almost always with strained resources and in challenging environments. This year, the Pride Agenda was able to provide some of that inspiration ourselves. It was truly humbling to have leaders from other states tell me how our marriage victory in New York has tangibly made a difference in their state. One talked about how the leadership of our governor was influential in getting their governor to come out in support of marriage; another said that the momentum we spurred in the Empire State might make the difference in a marriage ballot initiative they will be fighting soon. In recognition of the positive difference that our marriage victory has made nationwide, the Pride Agenda received an award (affectionately dubbed “The Feddie”) from our peers for 2011’s Most Amazing Accomplishment. The award was presented at the closing brunch where Tammy Baldwin, the out Wisconsin congresswoman, highlighted our achievement during her address to the group. Among the workshops and panels, the weekend also featured a presentation by the class of Federation Summer interns who were placed with over a half dozen state organizations across the nation. Pride Agenda was pleased to be able to host Geoff Montes, an NYU Senior who worked in our Communications Department. This amazing group of young leaders in our movement received a standing ovation for their talent, passion and hard work, and we were very proud to have Geoff be part of the outstanding group. This meeting also marked the end of my time on the Board of the Equality Federation, after having served during various points of my tenure as Secretary and Chair of the Governance Committee. I was honored beyond words to receive the Equality Federation’s very first Leadership Award for my service to the Federation and to the broader the movement. I am thrilled that the Pride Agenda will continue to be represented on the Board of this terrific collaborative by our Director of Governmental Projects and Community Development, Jonathan Lang. Rejuvenated and back in New York, I look forward to putting to use the new ideas generated from the summer meeting, and racking up more victories to share with our sister state organizations next year. This past weekend, LGBT activists from across the country gathered in Madison, Wisconsin for Equality Federation’s annual Summer Meeting. I was fortunate enough to have been selected for the Federation’s Summer Internship Program (along with seven other talented individuals from various state equality groups, left) and got the chance to attend the meeting and present about my time here at the Pride Agenda. The four day conference was filled with panels, workshops, luncheons, revelry and even an appearance by Congresswoman Tammy Baldwin at the closing brunch. The topics of some of the workshops I attended ranged from the federal hate crime prevention measures and national efforts for safer public schools to raising money from social media and collaboration between community centers and advocacy groups. Nighttime activities included the Federation Fling (held at the Madison Museum of Contemporary Art) and a Pub Crawl of some of Fair Wisconsin’s (the host organization) favorite local bars. The intern presentations took place Saturday, and aside from showcasing what I worked on at the Pride Agenda, interns from Texas, Oregon, Massachusetts, Illinois, Pennsylvania, Minnesota and Wisconsin presented on a wide range of initiatives they worked on over the past ten weeks. Equality Federation project specialist Renee Perry oversaw the intern program and was instrumental in organizing weekly conference calls for us as well as coordinating almost every aspect of our trip. Lastly, the Pride Agenda has intern positions open for the fall, so if you are interested check out our website for more information. *Photos courtesy of the Equality Federation. 15 states and the District of Columbia have passed a law protecting transgender people from discrimination, but New York is unfortunately not on that list. Our state is still without a statute protecting transgender people from discrimination in basic areas of civil rights like housing, credit, employment, education and public accommodations. As a result, in most parts of this state, you can get fired, kicked out your home or thrown out of a restaurant or store simply for being transgender. Clearly this is wrong. All New Yorkers should be treated fairly and equally under the law. Legislation that would extend civil rights to transgender people has been introduced into the state legislature every session since 2006, yet it has never been voted on in the New York State Senate. We cannot claim to have achieved LGBT equality without a statewide transgender non-discrimination law being introduced, voted on and passed by both the Assembly and the Senate, then signed into law by the Governor. Our work continues. One truth we’ve long held that was hammered home during the recent successful marriage campaign is the vital importance of sharing our stories. We, as lesbian, gay, bisexual, transgender and allied New Yorkers, need to talk about why it’s important to ban discrimination based on gender identity and expression. Testimonials and stories from transgender and gender non-conforming New Yorkers about the daily realities of their lives are especially vital in educating people, especially those who already support transgender rights but struggle to articulate the compelling reasons why. We hope you will share your story about why New York State needs protections for transgender New Yorkers. Email our transgender rights organizer, Christopher Argyros, at cargyros AT prideagenda DOT org. The public education work of the Empire State Pride Agenda helps change hearts and minds, not just so that we can pass a transgender civil rights bill, but so that all New Yorkers, including transgender New Yorkers, can live their lives with dignity. One third of transgender New Yorkers have been homeless. 74% have experienced harassment or mistreatment on the job, while 20% reported losing a job and 37% reported not being hired because of their gender identity or expression. 28% of transgender New Yorkers report having experienced a serious physical or sexual assault motivated by transphobia or homophobia. Since no single piece of legislation can solve these problems overnight, we’re working many different avenues to further transgender equality and justice. In early January, the Pride Agenda worked closely with Governor Cuomo’s office on re-issuing the Executive Order prohibiting discrimination in state employment on the basis of gender identity and expression. We’ve been supporting the Governor’s Office and the Deputy Secretary for Civil Rights to develop the policies procedures and training that go along with these guidelines. We have also been collaborating with other civil rights groups to urge the New York State Department of Health to improve the arcane and intrusive requirements to change gender markers on birth certificates. And through our Pride in Action programs we have been working with supportive companies and progressive unions to implement fair and inclusive polices, contracts and practices for transgender members, employees, clients and customers. In ongoing efforts to establish strong, committed and powerful allied voices in support of the transgender community, our outreach to local and statewide leading women’s organizations grows each week, and includes groups like the League of Women Voters of New York State. Similarly, we are broadening and highlighting the support of police chiefs from major cities like Albany and Rochester. This public support will play an important role in emphasizing that passage of a transgender civil rights law in New York State is an important safety issue. We continue to educate allies — LGB and straight New Yorkers, including supportive legislators — about the challenges faced by transgender individuals all over New York. Together we are mapping out a clear-cut, detailed campaign both to pass the transgender civil rights bill and to achieve broader equality and justice. But in order to be successful, we need your energy and advocacy. We understand that some people may want to share their story anonymously or semi-anonymously for comfort or safety reasons. Please let us know if this is the case and we will respect your wishes. Email our transgender rights organizer, Christopher Argyros, to share your story – or to get more involved in the transgender equality and justice campaign in your community. Join us. Our work continues.